Princeton University’s Climate Futures Initiative in Science, Values, and Policy launches a climate policy simulator, enabling students and the public to explore possible scenarios about emissions, temperatures and carbon prices for the coming decades. - do you think that the future counts less than the present? - do you think that the poor should receive greater priority than the rich? These moral questions are at the center of the models that seek the best climate policy. The unique feature of the Climate Futures Initiative model is that it contains data about inequalities in the world. This is important because the search for the best policy is not just about trading off the cost of emission reductions today for the benefit of future generations that will be richer than us. It is also about protecting the future poor against climate impacts to which they will be particularly vulnerable. 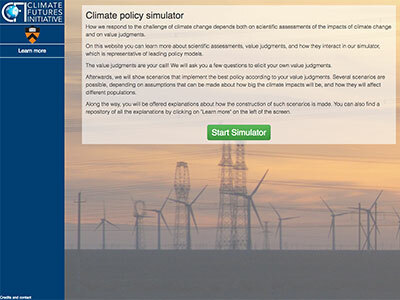 The simulator shows how the results depend not just on moral judgments made by the user, but also on empirical parameters over which there is uncertainty, in particular the scale of climate impacts, which can be mild or dramatic, and the distribution of damages across more or less vulnerable populations. At a time when climate policy is in flux, especially in the USA, it is important to familiarize the public with the reasoning behind climate policy discussions. Visit the simulator website, test your value judgments, and write to us to improve the simulator!